Today I'm sharing some of the kitchen items I use most frequently that have made a positive impact on my daily routine. I hope I can convince some of you to add one of these pieces to your kitchen to make cooking more streamlined and enjoyable. Here we go! This is my most loved and hence most used piece. It allows me to have over 1 L of boiling water in under a minute, and this goes right into the pot to start cooking my pasta/eggs/potatoes/veggies etc. It really does shave time off the meal preparation process! I also use it for rapid tea breaks, or for my french press. I love it! I love cutting produce and meats, so I become acutely aware of how poor quality a knife is the minute I use it. My parents brought my their home set for my apartment because it was my favorite one growing up, and I love being able to sharpen my knives whenever I want. A good set, as you can tell by the age of mine, will last you ages. It's a wonderful investment. I have a very thick, sturdy board. The biggest plus is that it moves around much less than a plastic board, and it also looks nice hanging out on your countertop. I have stopped using my plastic cutting board completely. I look for heavy aluminum and stainless steel pots. This allows for better heat distribution when cooking, and also permits food to cook evenly. In the future I would love to have copper cookware but I don't think I have the patience to reline the pot when necessary. What a hassle! Non-stick pans are my personal preference, but I also have cast iron skillets & pans. My father typically picks these out for me. They're heavy and just like the pots, they distribute the heat evenly so your food cooks at the same rate on all surface areas. I started using these this year to protect my cookware after my dad noticed I was ruining my expensive pieces by scraping the coating off my skillets. Woops! You live and you learn. An extremely useful gadget for those of you who leave little time to get ready in the morning! I have the water and coffee pod prepared the night before. I use a reusable pod with my favorite coffee instead of the prepackaged ones. The ones with a rubber seal so you don't leak all over your lunch bag/purse/knapsack. This is harder to find than it looks! I like the Sistema containers, but a couple have also leaked on me. Nevertheless, they are the most reliable. I used to use glass only containers, but they just got too heavy to carry multiple cases for one lunch. Ones with a good hand grip that can cut through tough plastic or meat/chicken. Packaging nowadays is insane! A fancy one for the table. I didn't think it was appropriate to pull out the jug with guests, and the Portuguese love their olive oil. My stove top is so much cleaner after cooking thanks to this little guy. I picked it up in October, so it's the one with the least wear on the list but I highly recommend for cutting down on cleaning time. 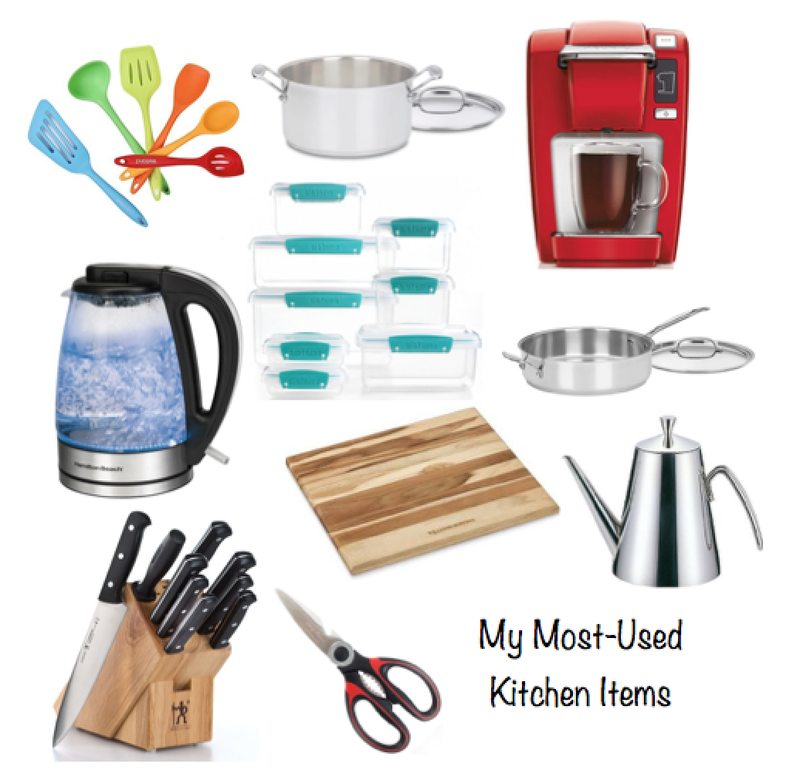 Tell me what your most useful kitchen items are, and I can put it on my next shopping list!